My family has finally cracked the code for a stress-free Thanksgiving. 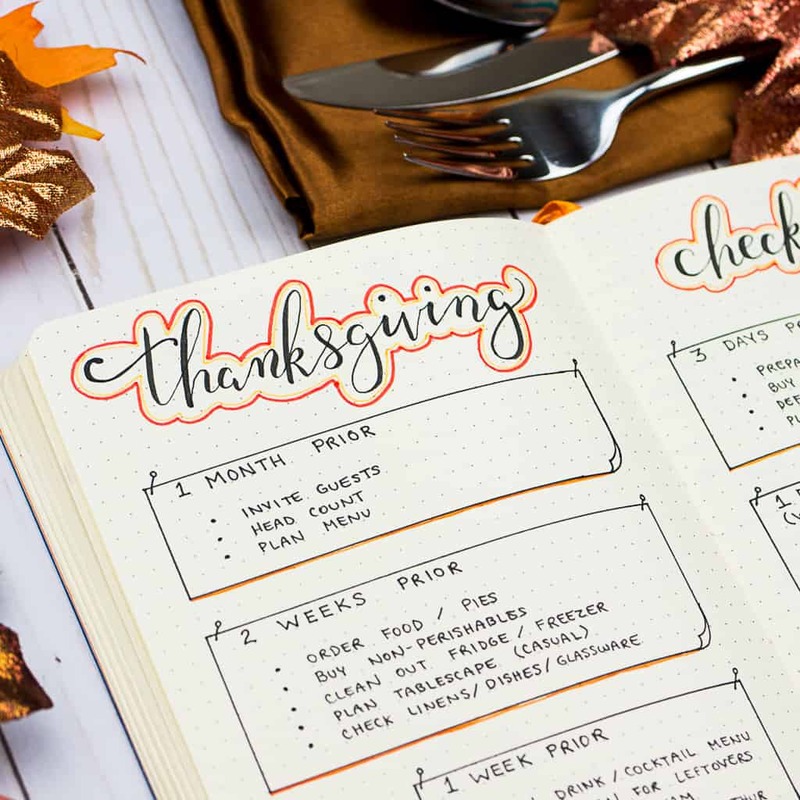 Check out these journal pages to rock your best Thanksgiving feast ever (even if you hate cooking). 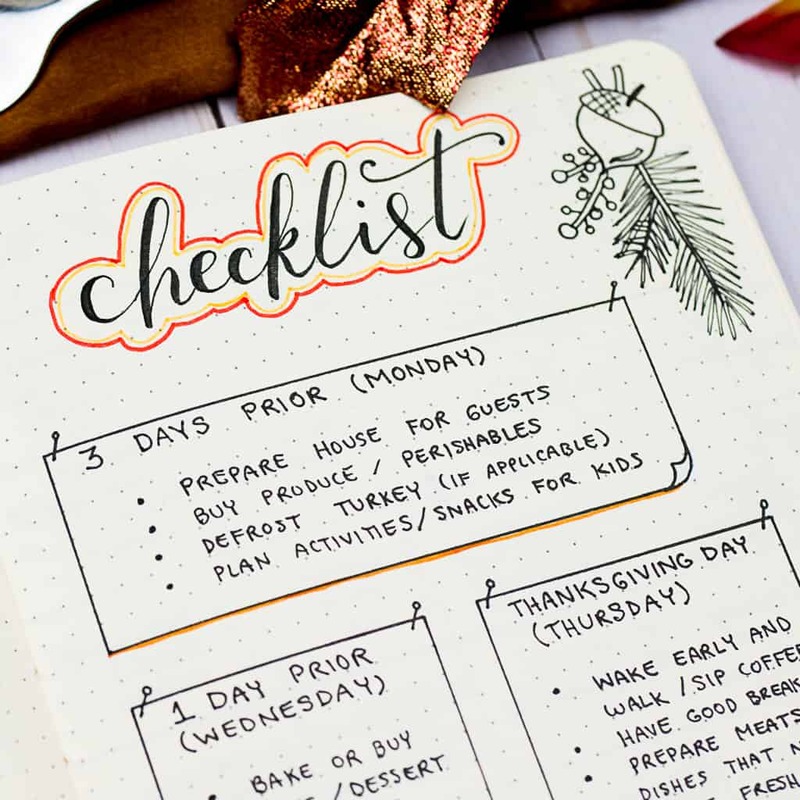 Plus, there’s a free printable checklist for you. Get ready for some epic gratitude! Thanksgiving is one of those holidays that leaves people somewhat divided. Love it? Hate it? I used to be on the second team. If you read my blog with any regularity, you might already know that cooking doesn’t give me “all the feels.” Not to toot my own horn, but I’m a pretty good cook. I didn’t say I like it, though. I would rather do almost anything else with my time. Especially when EVERYONE else is relaxing in front of a football game! After almost a decade of my grumbling about Thanksgiving, Mr. Page Flutter and I finally came up with a better way to do it: Get back to gratitude. So simple, right? By focusing on gratitude, we don’t have to worry about anyone else’s expectations for the day. We stopped putting so much pressure on the meal, decided homemade is overrated, and we make the day easy and casual. For everyone. We also gave ourselves the freedom to eat some non-traditional Thanksgiving foods that we enjoy much more than the originals. Finally (and this one is important), we try to spend Thanksgiving with people who share our stress-free attitude. Three of our very favorite people are coming for Thanksgiving this year, so I’m prepping things early! Rhodia Goalbook: I got mine from J*B Welly. It is also available on Amazon, but you may want to do your own price comparison. Tombow MONO Drawing pen: My new favorite. I also love my Sharpie pens and Pigma Microns, but the Tombow is especially smooth. Tombow TwinTone Planner pens (brights): I used these to outline my header lettering. Tombow Fudenosuke (Firm): Used for the simple brush lettering on the header. Here’s my simple and not-quite-homemade approach to Thanksgiving. 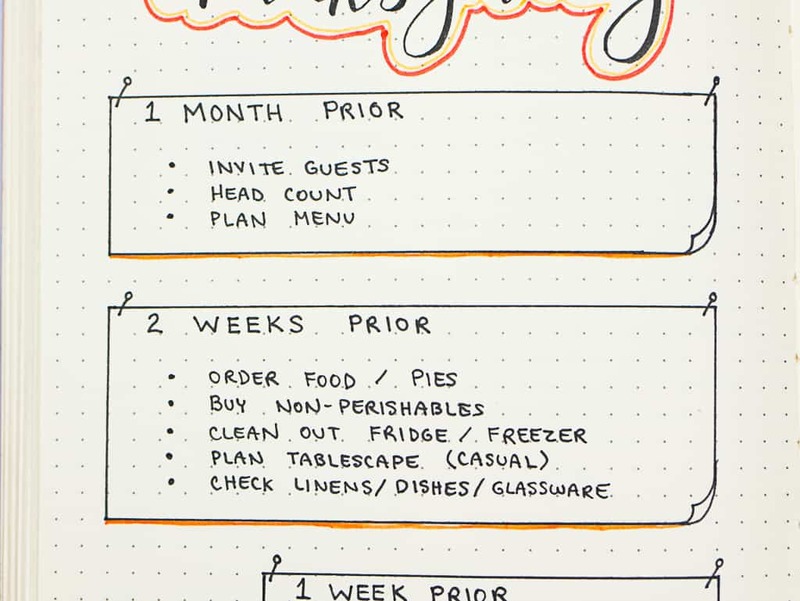 There’s a free printable checklist at the bottom of this post. 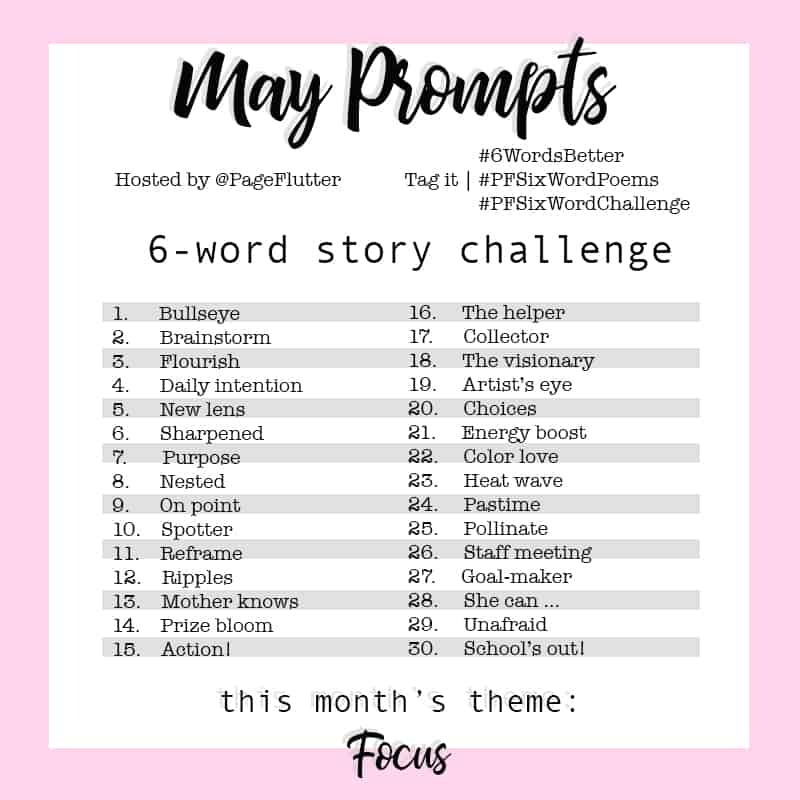 If you’re a subscriber, you get your choice of the letter-sized printable or my handwritten journal pages (both available in the Page Flutter Vault). 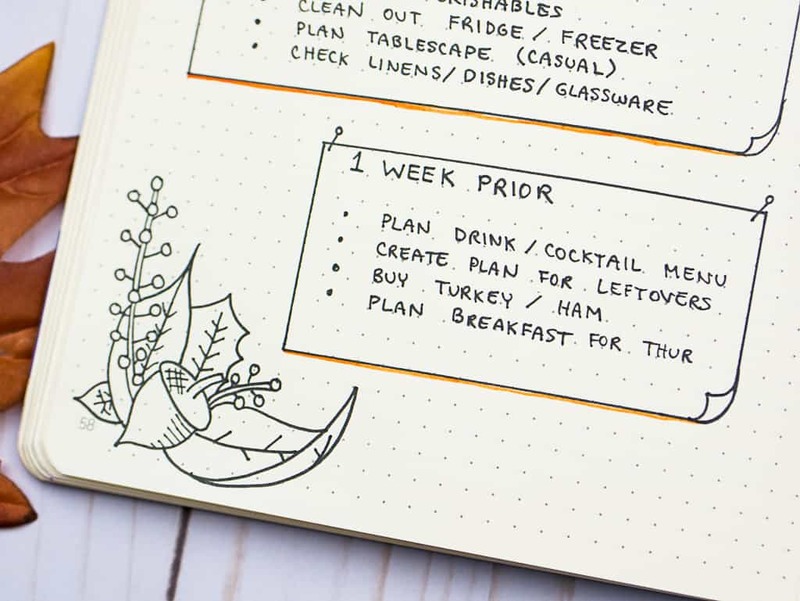 These checklists also work for those who want a full-blown homemade extravaganza! Early planning is the key to keeping things easy. I’m too lazy to zip across the city looking for the ONE store that still has whole apple pies. About a month before Thanksgiving, I map out how many people we’ll have, consider any food allergies or aversions, and start planning a menu. I plan foods we can all savor in a casual environment. If no one likes turkey, we don’t cook one. After all, the food is only there to give us something to gather around. We’re more interested in companionship and expressing thanks. 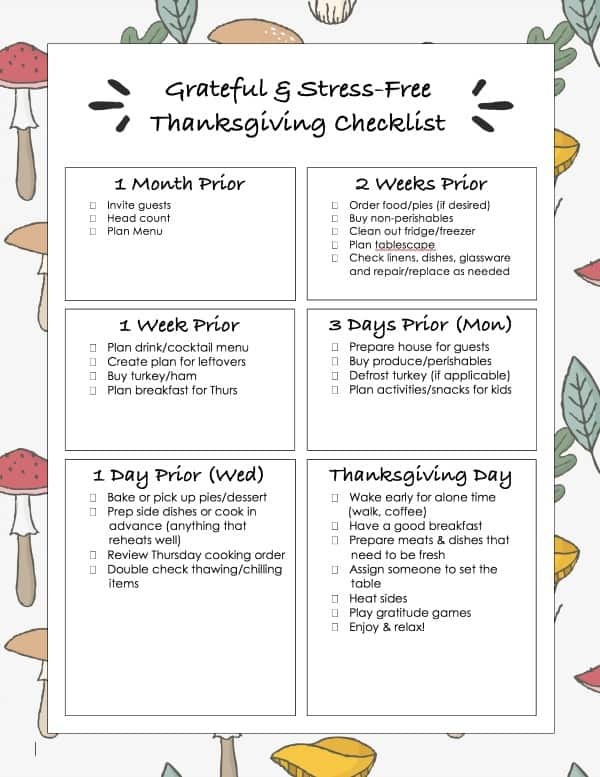 Now, here’s the real secret to my stress-free Thanksgiving…you ready? I don’t cook it. Or more accurately, I only cook about 10 percent of the meal. The rest is being delivered! If you don’t live in an area that has hot meal delivery (I don’t), you can order a heat-and-serve feast from places like Harry & David’s, Omaha Steaks, or Honey Baked Ham. Two years ago, I ordered our feast, and it was the best decision ever! I spent less time in the kitchen, so we were able to focus on being together. The food was fantastic, cleanup was easy, and everyone had a great time! I’m not sure I’ll ever go back to cooking Thanksgiving from scratch. *On a side note, this is a good time of year to make a monetary donation to your local food bank. They usually get more volunteers than they can handle at Thanksgiving, but monetary donations allow the organizations to allocate aid where and when it’s most needed. Also, consider volunteering during non-holiday times. The week before Thanksgiving is a good time to check your stock of spirits. If you’re planning a special cocktail, you’ll want plenty of leeway to find the ingredients. It’s also a good time to get your turkey or ham (if you’re cooking your own). A week is about as long as I can stand to have my freezer space taken up, but at the same time, waiting too long makes for slim pickings at the store. I always plan an easy and filling breakfast for Thanksgiving Day. Everyone is happier when they’ve had a good breakfast. Trust me, a hangry (hungry + angry) mob popping into the kitchen every 5 minutes asking “Is it ready yet?” doesn’t make for a stress-free day! The countdown is on! Not really. By this point, my freezer is well-stocked with my pre-made Thanksgiving dishes, and all I have to worry about are the perishables. If I were cooking the feast from scratch, now’s a good time to start defrosting the bird. I also do a quick zip through the house to get things tidy for house guests and stock up on kid-friendly snacks. Thanksgiving is the best day of the year to celebrate and embrace gratitude. You can also incorporate gratitude games to teach kids about being thankful. Check out this website and this one for inspiration and game ideas. After the kids are in bed, the grownups can break out Cards Against Humanity! The day before Thanksgiving is a great day to chop, prep, and pre-bake (think pies, casseroles, and anything that reheats easily). It’s really just a day to take things easy and double check the feast preparations. Since my crowd is pretty low key, our prep day can be slow and leisurely. It’s a day for reflections, company, and planning. As an introvert, I need a lot of solitude. Having company is always a joy, but I also have to make sure I get my alone time. On big days like Thanksgiving, I like to wake early and ease slowly into the day. I make coffee, go for a walk, and give myself time to breathe. From there, I can make sure everyone has their breakfast (which I already prepped). Most of my Thanksgiving dinner is heat-and-serve, so I can float between the kitchen and living room, visit with guests, and put my feet up a bit. Nothing left to do but enjoy the day! After I created my journal spread, it occurred to me that many of you may prefer a single page you can put on the refrigerator. 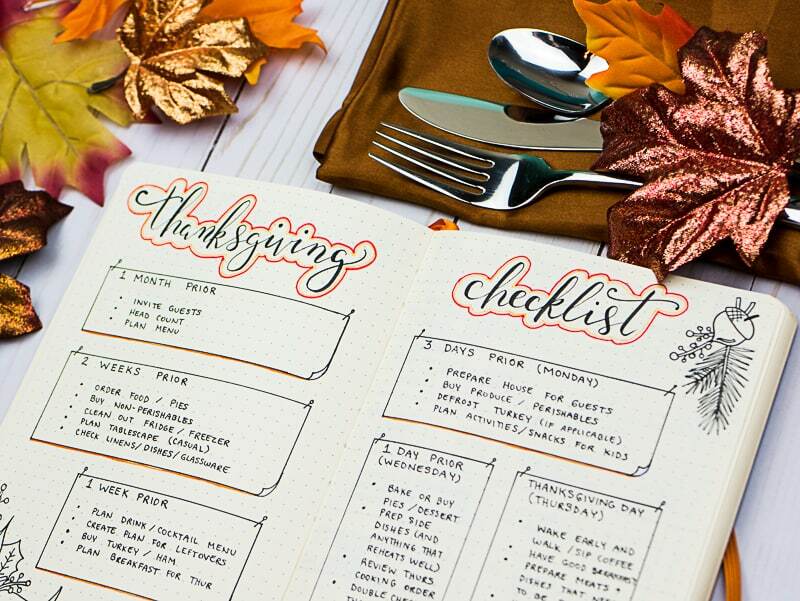 I whipped up this version for anyone who popped over from Pinterest just for the Thanksgiving checklist. 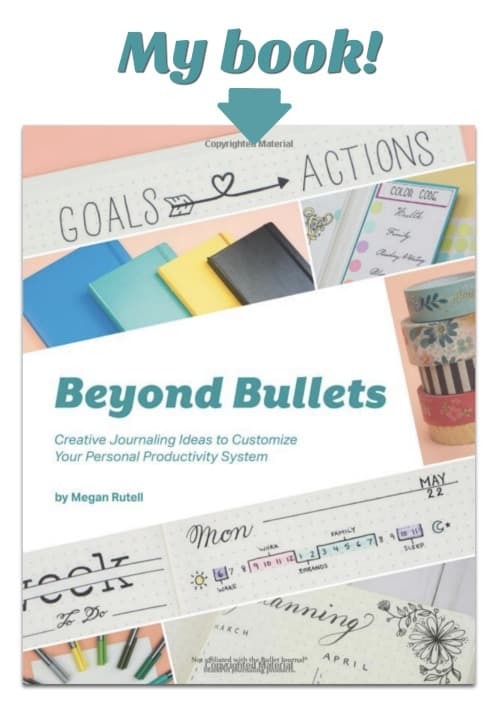 Feel free to click around my corner of the web if you want more info about this whole paper planning and Bullet Journaling trend. 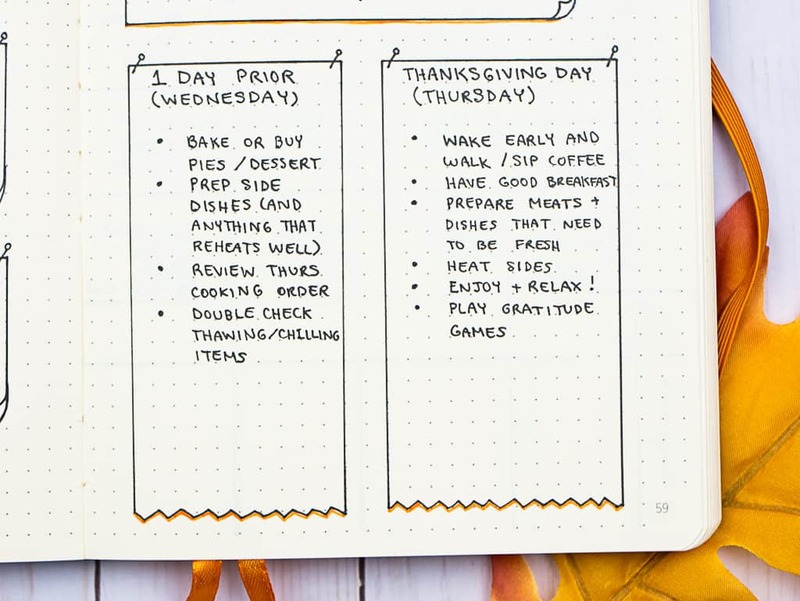 Subscribers can also grab my handwritten Thanksgiving journal pages in the Page Flutter Vault. Not a member yet? No problem! Subscribe to my monthly newsletter and I’ll send you a password! This slower approach to Thanksgiving gives me time to sit with my family, laugh with them, and reflect on the blessings of the year…To truly soak in the message of the day. I’m so grateful for my readers and the incredible community you’ve built with me. Happy Thanksgiving! How do you celebrate gratitude this time of year? Do you have any tips or traditions that make Thanksgiving more meaningful for you? Comment below to share the spirit of the season. My family decided to do a pot luck type of Thanksgiving feast a few years ago and we rotate hosting between my sister and myself. The host home takes care of the meat and one other dish, the rest is up for grabs by the attendees, although they do specify what dish(es) they are bringing when they RSVP. I don’t know how my grandmother and mother used to do it all! Neither my sister or I really enjoy cooking, so this has been a true blessing to have everyone pitch in!